The Helsinki Central Library is one of a number of new projects which have been built to celebrate Finland's 100 years of independence. Imagine a country that is home to some internationally famous tech companies. Now, imagine this digitally advanced nation also has one of the highest broadband speeds in the world; by 2021 almost 86% of its population is expected to own a smartphone. And then, think about how this country will plan to celebrate the centenary of its escape from the shadow of foreign rule: next, imagine a gleaming building filled with books. Because Finland – which ranked second in the World Economic Forum’s 2016 Network Readiness Index – aims to mark the 100th anniversary of its independence from Russia by opening a brand new library. The Helsinki Central Library, also called Oodi, scheduled to open in December 2018, will not only house books. The building will also boast a cinema, a recording studio, and a space where old objects can be refashioned into new items. It can also be entered via a supermarket. 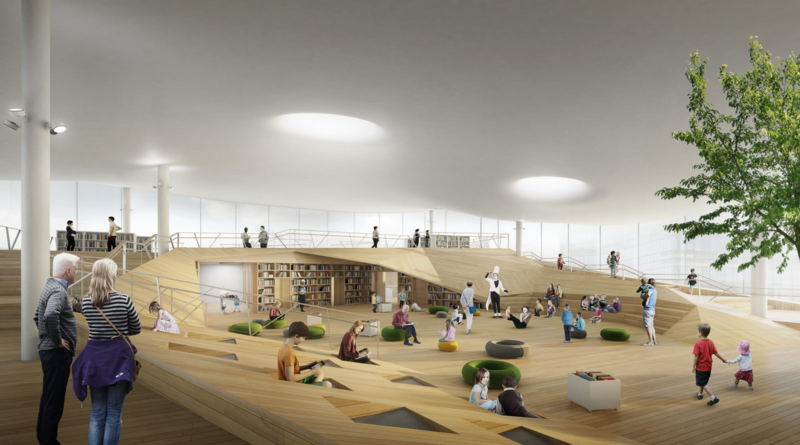 Artist’s impression of the design for the children’s area of the Helsinki Central Library. The building received near unanimous political backing and was designed with the help of a supportive public as part of a wide consultation process. Located in the heart of the city opposite Parliament House, the library is one of the flagship projects celebrating the centenary of Finland’s independence. The estimated cost of the building is €98 million ($115 million). The state will pay €30 million ($35 million), while the city of Helsinki will pay the rest. The country, named the happiest on Earth by the UN in 2018, is noted for its high level of public services and it seems libraries are among the amenities Finns love best. Finland’s 5.5 million inhabitants borrow more than 68 million books a year. The Finnish love of libraries was explored in a 2017 New Statesman article. This described how they borrow “virtually everything you could ever want – from cookware for a dinner party to drills for home improvements, along with art, footballs, garden games and sewing machines. Everything is free: providing high-quality library services at no cost to the public is enshrined in Finnish law”. Because of their place at the heart of local and national culture, libraries are also the centres of public events, such as concerts, literary talks and cinema shows. People come into them to work: some have a section set aside for children to do their homework. For bibliophiles, students, academics and researchers elsewhere, the very idea of such a library seems like a book lover’s heaven. In the United Kingdom a very different story is being told: one of fewer book loans, falling visitor numbers and regular calls for qualified staff to be replaced by unpaid volunteers. Tales of library closures due to tight government budgets are also being told in the United States and Canada. Despite this, however, the very idea of libraries remains essential in cultures that wish to be seen as enlightened, progressive and relevant. Perhaps the notion of libraries as austere places where absolute silence reigns has not helped their image. But in Oodi, the library is returning to its roots: as a place where people can meet as well as learn. After all, the largest library of the ancient world, Alexandria in Egypt, built around 300 BCE, hosted collections of works, lecture rooms, meeting places and gardens. And, despite cutbacks elsewhere, large, attractive public libraries are still being planned and built with the intention of attracting contemporary visitors. For example, a refurbished library in Newcastle in the UK, will offer high-tech IT equipment, including tablets, a 3D printer and Raspberry Pi computers. Meanwhile, a library in Halifax, Canada, was built in a series of glass rectangles stacked one on top of the other. The building, opened in 2014, offers an auditorium, cafés, a children’s play area and reading and study space. While the libraries of the future are going high-tech, it seems they are also returning to the Alexandrian concept of what libraries should be: places where communities meet, talk and connect.